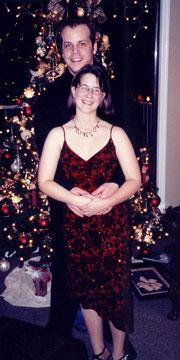 The photo below was taken on New Year’s Eve 2002 ~ right before we became parents. Ok, so I guess we won’t be parents until the baby is born, but you know what I mean. I was so excited that he saw it, too! I called the doctor’s office and went in for a blood test. 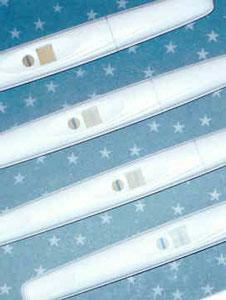 The blood test confirmed that we are pregnant, and my hCG levels were a mere 18. The nurse said that means that the pregnancy was VERY new, and they wanted to re-test my levels in one week to make sure that they are rising. On January 17th, 2003, my hCG levels were 683 ~ definitely rising! I had one more blood draw on Sunday, January 19th, 2003, to confirm that they are doubling every 48-72 hours like they should be, and the results were 1,474. So it looks like everything is right on track. We had our first appointment with our midwife, Susan Willis, on January 17th, 2003. Contrary to what most people think about midwives, we are NOT hippies and we aren’t giving birth at home. We will deliver at the Birthing Center at St. Joseph’s Hospital in Bellingham. Susan gave us a due date of September 23rd, 2003, but said we should expect the baby anytime in September, really. Our next midwife appointment is February 14th, 2003 at 4:15 p.m. (PST) ~ we’ll post an update afterwards. We may have our first ultrasound the first week of February, too.